You can view statistics about performed guest OS file restore sessions. At the top of the Restore Session window, Veeam Backup & Replication shows general session statistics: a name of the machine whose guest OS files are restored during the session, a user name of the account under which the session was started, session status and duration details. The Statistics tab shows detailed information about the files restored during the session. The Reason tab shows the reason for the guest OS file restore that was specified at the Reason step of the File Level Restore wizard. 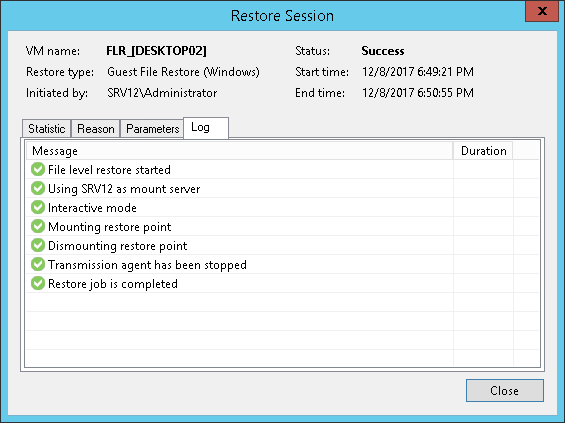 The Parameters tab shows information about the restore point selected for the guest OS file restore at the Restore Point step of the File Level Restore wizard. The Log tab shows a list of operations performed during the session.